Even if you are not an adrenaline junkie, the beauty of the landscape and the numerous accessible trails will make you want to walk or cycle around the island. Below are some of our favourite routes. This is a moderate route as it doesn’t involve any serious uphill pedalling. The winding road you follow stays close to the sea so you get some fantastic views along your route. Passing through a number of smaller villages such as Žrnovska Banja or Kneža, you can stop off for refreshments at one of the local restaurants or pick up some reserves at the small local supermarket. The peaceful fishing village of Racisce is a welcoming destination and offers some great swimming spots should you wish to cool off after your cycle. Head through the village and up the hill, following the homemade sign to Vaja Beach for less than 10 minutes. Dismount and scramble down to your right; it’s quite a steep uneven track but the beach is worth it. This is more of a hard-core pedal with tougher and steeper hills in parts. To reach any of the bays, you need to go all the way down off the main track, which means coming back up! The free-wheeling down is fun, but the cycle up (or in my case pushing the bike up) isn’t so easy or rewarding. There is a small restaurant at Orlandusa called Simunovo, which serves rustic style meals. You will need to take a packed lunch with you if visiting the other bays. These bays are quieter than the main beaches due to their remoteness and out of the main season you will have them all to yourself. This is one of the easiest cycling routes you can take. There is a cycling path along part of the main road between the suburb of Sveti Antun and Lumbarda. You can either take this road directly all the way there or can take a few detours around Donje Blato or Gornje Blato. The direct route includes a few hills and it’s about a 5km ride. Once in Lumbarda you can visit one of its fantastic beaches, stop at a local winery or take a further ride out to the lighthouse. Our self guided Instagram tour from Korcula to Lumbarda provides information about a few routes you can take and some helpful information & tips along the way. A walk to the fascinating rock formation above and beyond the hamlet of Brdo in Žrnovo is a great experience. You get some incredible views of the Peljesac channel walking along the hill path to Kocje and the area of the rocks is very peaceful and relaxing. There are a number of routes you can follow from Korčula old town; just get to Žrnovo and follow the sign to Kocje through Brdo for a further 20 to 25 minutes. There is a Konoba serving traditional food on the left just as you pass the signpost for Kočje, called Belin, where you can stop for lunch or refreshments after your walk. You can hire cycles from the tourist agencies in the larger towns or village (e.g. Vela Luka, Korčula, Lumbarda), by the hour or for the day at a reasonable cost. Pick yourself up a detailed map from the agency or tourist office. Many of the routes are marked by red circles or dashes on the ground or signposted; some are more about following your senses in the right direction. If you are walking or cycling during the hottest periods, make sure you pack lots of suntan lotion and water. Found this post helpful? Pin it to your Korcula Island board. I see you’ve also done a post about keeping active while on holiday, like we did today in our post about Ciovo-Trogir. 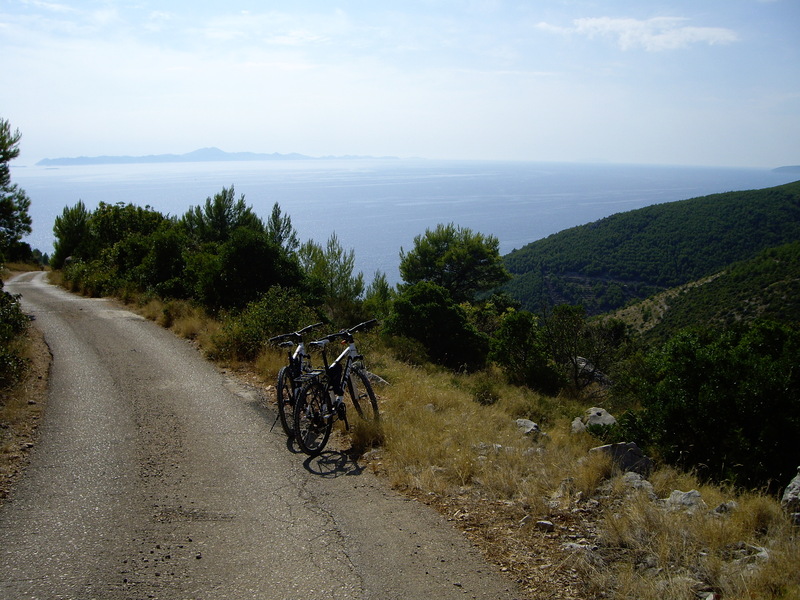 There are cycling routes in Ciovo too, so we are planning a post about mountain biking too. Fantastic, great post, thanks for sharing. The Dalmatian coastline isn’t just about lying on the beaches and soaking up the sun (although fantastic way to spend your holiday! ), there’s so many fun active things to do and very good reasons to visit the country outside the “traditional” summer months. Hoping to do some of these trails if I ever make it to Korcula. My favourite cycling routes are those around Smokvica, through the picturesque hills, vineyards and olive groves.